Steel Balls, Carbon Balls, Stainless Steel Balls, Carbon Chrome Balls, Brass Balls, Lead Balls as an active Manufacturer, Supplier, Dealer, Distributor, Trader and Seller etc. (*Importer/Exporter/Service Provider). 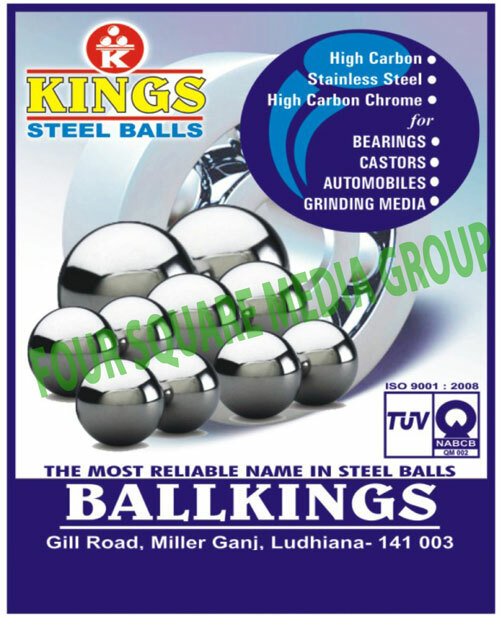 Ballkings, based in Ludhiana, the industrial hub of Northern India, is one of the leading manufacturers of Steel Balls.' Engaged in the production of industrial balls in various ferrous and non-ferrous metals, we conduct business across the nation. Formed in 1988, as a wholesaler of steel balls to the industry in the region, Ballkings subsequently emerged as one of the best manufacturers of Steel Balls in this part of India.